Dream In Darkness: Thanks to Seth Apter for a Great Two Months! 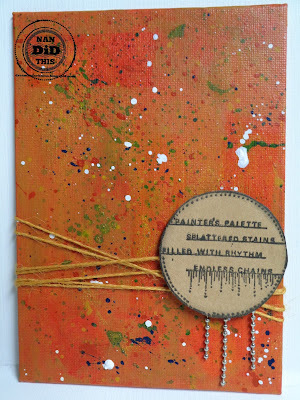 This canvas painted with Grumbacher acrylic paints and Transparentizer, has one of Seth's Large Journal Coins with are so great! I can't keep from stamping them up and playing! So thanks to Seth Apter for the fun and thanks to all of you who entered and good luck! I know you can't wait to see who gets a prize from Seth Apter! Have a wonderful March from Dream in Darkness and just a hint: March has a special surprise, also, so don't miss checking us out tomorrow! Nice. Love the string and that background!! Splatters get me every time. Thanks so much, Seth! Those journal coins have enchanted me!